CHP and fire personnel at the scene of a shooting on I-580 in Oakland. 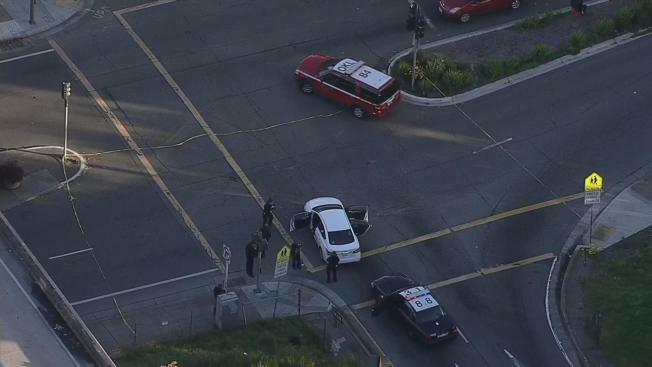 The California Highway Patrol is investigating a shooting that injured two people and temporarily shut down all eastbound lanes on Interstate 580 in Oakland. When officers arrived on the scene, they found a man and a woman suffering from gunshot wounds. Emergency medical personnel responded to the scene to provide medical attention. Both victims were transported to a local hospital and were listed in stable condition. All eastbound lanes of 580 between 14th Street and Fruitvale were shut down for about 2 hours, clogging the afternoon commute, the CHP said. The freeway lanes reopened just after 5 p.m., the CHP said. Both the CHP and Oakland police were on the scene investigating, with some officers on foot, scouring the empty freeway for evidence. Investigators believe the car was targeted, as it was the only one with bullet holes. Fruitvale off ramp from eastbound I-580 is closed due to a shooting investigation. Unknown time frame, expect delays. Details to come.